SINGAPORE (Reuters) - Singapore is to hold a rare anti-government demonstration against plans for a dramatic increase in immigration that would boost the island's population by as much as 30 percent by 2030. Discontent is growing in affluent Singapore over a rising number of foreigners blamed for strains on infrastructure, ballooning housing costs and transportation headaches in a country slightly smaller than New York City. Public expression is a delicate act in Singapore where government figures, including elder statesman Lee Kuan Yew, father of the current prime minister, Lee Hsien Loong, have sued critical opposition MPs for defamation. Nearly all media are pro-government. 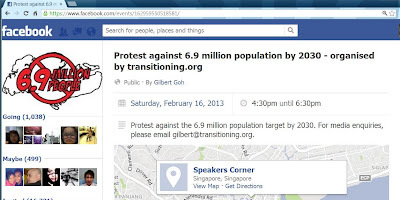 Protest organiser Gilbert Goh said he hoped to attract 1,000 people to the February 16 event at Speakers' Corner, a designated park exempt from strict government controls over assemblies, speeches and outdoor protests. 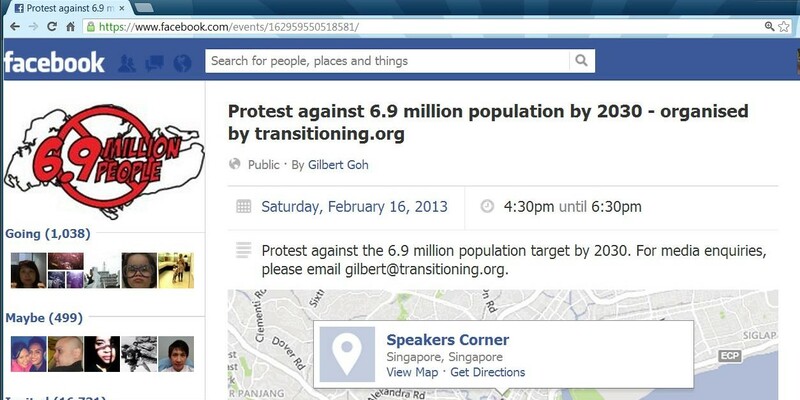 Nearly 1,100 people said on a Facebook page they will or may join the demonstration against a government proposal on January 29 to raise the population to 6.9 million. Of that, up to 36 percent, or 2.5 million, would be made up of foreign workers to balance a low birth rate and sustain economic growth. "Let us send a strong signal to our government that we don't want 6.9 million people living here by 2030," Goh said. The public generally supports Singapore's tough laws and tight social controls as part of a social contract that in return has delivered years of economic prosperity. But calls for change are growing. Opposition parties won record support in the 2011 general election. The long-ruling People's Action Party, founded by Lee Kuan Yew, occupies 80 of 87 seats in parliament but lost two recent by-elections by surprisingly large margins in signs of mounting discontent.